The LifeSpan Fitness RW1000 is a sturdy and quiet Magnetic Resistant rowing machine that comes at a very reasonable price. It includes multiple levels of resistance that makes it suitable for people at various levels of strength and fitness. Its long rail makes it very ideal for tall people. Although it can take up a lot of space when set up for training, it can be easily folded and tucked away into the closet. It is a great machine for rowing training as well for achieving various levels of fitness. An appealing feature of the machine that sets it apart from other types is that it works silently. An issue in the best brands of air and water resistant machines is that they can be very loud. It provides a smooth rowing action and is very comfortable to use. It includes a multi-function fitness monitor to record the workout data. The LifeSpan Fitness RW1000 is the 2008 Gear awards Seal winner for being comfortable to use, smooth and quiet. It offers a five year warranty on the frame and two years warranty on the parts. The rower is great for total body workouts and concentrated workouts. In the later, users are able to burn fat and gain muscle in less time. This is a good rowing machine. Tt gets the job done. 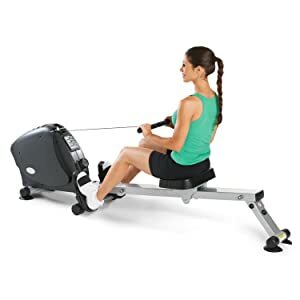 Resistant Type: It is a Magnetic Resistant rower with a 16 pound flywheel, which is responsible for the machine’s ultra-smooth rowing action. Five levels of resistance options make the rower suitable for users with most fitness levels and strength. Unlike an air rower, the resistance level cannot be changed on the fly. The levels can be switched through a knob below the control panel, after the machine comes to a standstill. The resistance is more suitable for beginners and intermediate rowers. Some users reported that resistance tension is weak; they were not able to receive a challenging workout. It features a multi-screen LCD fitness display monitor that keeps track of calories, time, strokes per minute and stroke count. The training feedback is a great encouraging and motivational asset to help the users reach their fitness goals. It is powered by an AA battery. The device turns on automatically when the workout starts. It powers off when the rower is inactive for 4 minutes thus saving battery life. The recorded workout statistics are divided into three separate screens. The display is easy to read and the fonts are fairly large. It however has no back lit; some light will be required to read the statistics if working out in the dark. It does not store the workout data; the user will have to make a note of the results if he wants to retain the information. The frame is made of sturdy stainless steel that gives it an overall solid look and feel. The lifespan Fitness rower comes with a very generous warranty and a high user weight capacity. Magnetic rowers usually operate silently but users have not experienced any of the usual squeaking or creaking sound either. The seat in LifeSpan Fitness Rower RW1000 is believed to be very comfortable. It is suitable for marathon rowers who spend longer periods on the machine. The height of the seat is also adjustable as preferred by the user. It glides up and down smoothly without any issues. The handle is easy to grip with proper padding for extra comfort. The footrests swivel to allow for natural movement of the feet. Although some users found their feet occasionally slipping out during workout. Comfort is the most talked about feature of this model — smooth operation and comfortable seat. The nylon strap attached to the handle has no-slack retrieval; this ensures a smooth rowing action. It can be easily dismantled for storage; one just needs to remove the pin that secures the seat rail and fold up the rail. It also includes wheels which makes it easy to move it around when required. The high capacity feature of the LifeSpan fitness RW1000 has made it quite popular as a machine for cardiovascular training than rowing. It can carry a user weight of up to 300 pounds. The seat moves far on this rowing machine, so shorter people can also use the machine without any issues. The seat rail is long which makes it suitable for tall people too. The machine doesn’t have too many parts that need to be assembled. It comes with necessary tools; it requires very less time to put it together. Most users revealed that it takes them around 20-30 minutes to assemble LifeSpan fitness RW1000. The advantages of owning a LifeSpan fitness RW1000 are: Solid Steel Frame, Good Warranty, can be folded in seconds for storage, comfortable to use, smooth rowing operation, super-quiet, 5 levels of adjustable resistance, easy to assemble, comes with heels and can be used by both short and tall people. Some disadvantages of the machine are: Not suited to people with advanced fitness level; foot pedal design may cause feet to slip out during rowing; and below average fitness monitor.